With Wiarton Willy, Punxsutawney Phil and Balzac Billy tucked back into their dens for another six weeks, a new snowfall and the annual Dunnville District Historical Association's Heritage Day display only ten days away, I felt the need to rediscovery summer. This was done by looking back to an early article I wrote for my now retired historyletter The Grand Dispatch. The article was originally written with the interest of the Beckley Beach cottagers in mind. However, I believe it will be of interest to anyone who has any knowledge of Port Maitland. It is rather long and will require I show a number of photos, so it will take two issues to tell the story. Part two will be published in the Chronicle on March 10th. Postcards in the late 1800s and early 1900s, were a very important tool for remembering our vacations while providing us and our friends with visual evidence of our fun in the sun. Not only were they useful for the obvious reasons, but many a love note was passed openly in the mail to the sweet young thing we fell madly in love with during our summer vacation. You would not think there could be more than five or six postcards of Port Maitland/Beckley Beach. Once I collected ten, I knew there were no more! Then when I became the proud owner of twenty-five, there was no doubt I had the corner on these precious and very rare relics. Now I own one hundred plus. When I combine my collection with that of a few friends, I believe there are likely more than two hundred. Sometimes there are notes on the backs giving just a tiny bit of insight into what was happening during a time now long forgotten. One such card, sent home to Summit New Jersey, by Elizabeth who did not give her last name reads in part "tell Arthur, we have a fine 1916 Franklin, it goes like a bird." I wonder what a 1916 Franklin looked like! Many others show no more imagination then today's vacationers possess when they write, weathers fine, having fun, wish you were here. 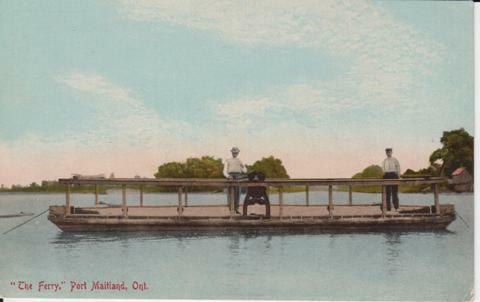 One card postmarked at Port Maitland in 1913, to Mrs. Wm. Hardy, of 217 Robinson St. Tonawanda, NY. is from Anna. It reads "Dear Mary, Am having a fine time." Signed Anna. Postcards tell where visitors came from. Old postcards often tell you where visitors came from by the addresses to which they sent the cards. Many Port Maitland cards were addressed to Hamilton ON, and locations in the USA, with Buffalo, Rochester, and Tonawanda NY, being the most popular spots, however, Erie, PA and Detroit, MI. rank high on the list. 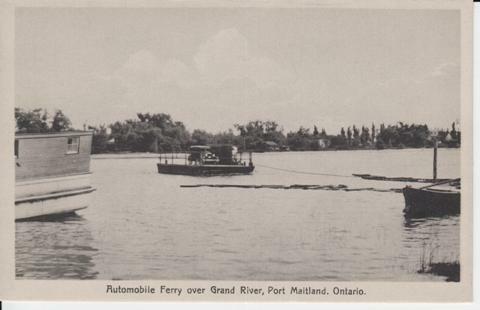 Port Maitland, including both sides of the Grand River, was a very popular vacation spot in the late part of the 19th century and the early part of the 20th. It was dotted with numerous hotels, boarding houses and bed and breakfasts. A rough estimate of rooms to be had in1900, is 130 plus. 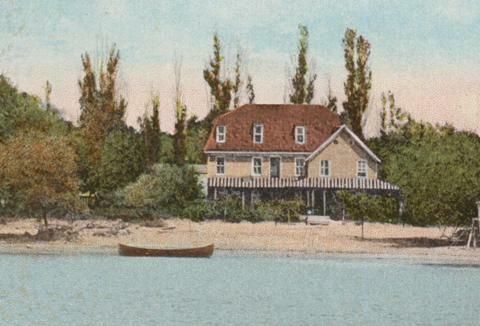 Jesse Taylor's, at Beckley Beach, was built by Charlie Ross and his sons Frank and Charlie. It is sometimes remembered as The Club house. Owned for years by Jesse Taylor, it was best known as Jesse Taylor's. This is borne out by my postcard collection showing numerous cards bearing this name. Taylor's was also known as The Poplars. The Poplars was briefly owned by Harry Latta and lastly by Dolly (Irmine) Gray. The hotel succumbed to fire on December 4, 1933. An article found in the Chronicle reads; About four o'clock Monday morning The Poplars, a well-known summer resort at Port Maitland run by Mrs. Dolly Gray, was completely destroyed, together with its contents. The cause of the fire was unknown at the time, as the house was untenanted at the time, one part having been vacant for two weeks and the other since September. Mrs. Gray is residing in Hamilton. The house is situated on the Sherbrooke side of the river, and the fact the ferry is not running stopped the Port Maitland Fire Department from taking their equipment across. The members of the department however together with other residents crossed in boats and kept a strict watch on the adjoining property. The loss was about $5, 000, partly covered by insurance. The property on where Dolly's hotel was located is now occupied by two cottages owned by Ed. Boyle, and Jack Curtis. Ed's cottage sits on the original cement pad where the hotel stood. The cottage has a sidewalk laid by Frank Carr, an interesting Port Maitland character. He and Dolly took the time to scratch their names into the wet cement. I wonder! Not only do we unearth long forgotten establishments that once dotted this community, we learn some history about them. When we look across the river from Dolly Gray's, we see the former Maitland Arms Hotel. We know the present building as the Port Maitland Apartments. Before this one storey block building, there was a three-storey wood-framed hotel, originally known as the Martin's Hotel. 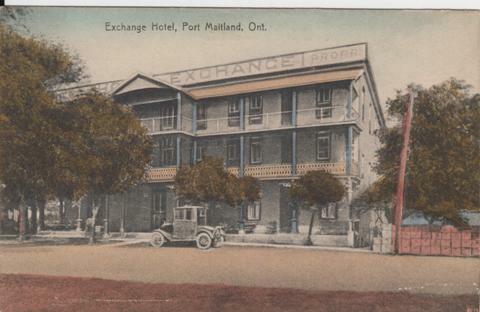 Then in a postcard dated April 18, 1912, we see a sign stretching the full length of the building proclaiming Hotel Exchange - Ed Martin Propr. Sometime, possibly in the 1930's the name was changed to the Maitland Arms Hotel, a name more familiar to many of us. If I could find a postcard of this building dating in the mid 1950's, we would see only two floors remained, as the top floor was severely damaged in a fire and removed by then owner, LeRoy Kramer. My aunt and uncle, Bill and Etta Reid had some investment in the hotel at that time and their son Billy had an electric train set running from room to room on the third floor. It is believed, somehow the train was to blame for the fire. The present block structure was build by Frank and Eleanor Stouph and opened in the fall of 1963 after fire destroyed the former wood frame hotel in the spring of 1961.